The back cover features the statement, "Discipline is never an end in itself, only a means to an end". 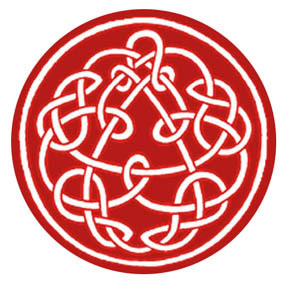 King Crimson purchased the rights to use a variation on a copyrighted Celtic knot on the LP cover. 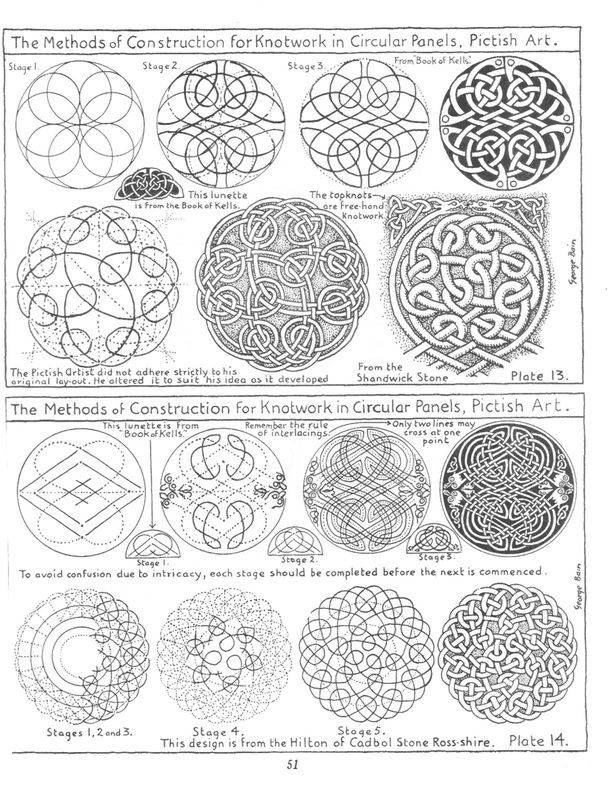 In later releases, it was replaced by a knotwork designed by Steve Ball on commission from Robert Fripp. 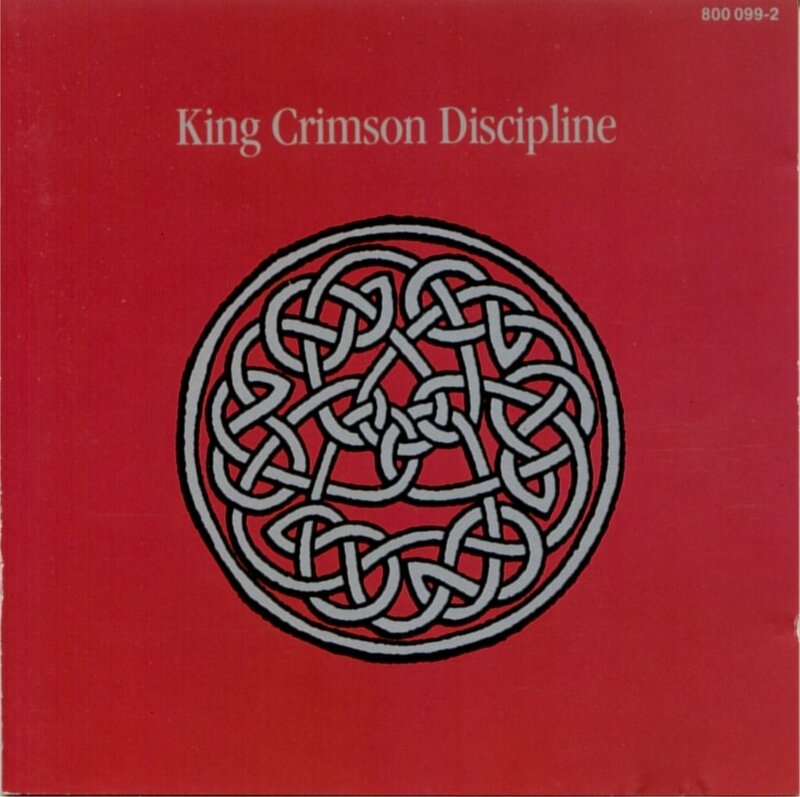 Ball's design is also used as the logo of Discipline Global Mobile, the music label founded by Fripp, which has become the label for King Crimson, Fripp, and associated artists. -- King Crimson finally abdicated last week. But the end came with a whimper, an official statement merely commented that the band had "ceased to exist". -- There had been, apparently, no traumatic personality clashes within the band, no final bust-up. 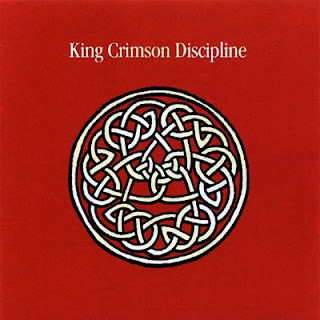 Robert Fripp had simply decided "it was time for King Crimson to come to an end". -- That decision was taken on the eve of the release of Crimson's eighth album, "Red", which promised a new chapter in the band's evolution. Ian McDonald the Mellotron player with the original band, was to have re-joined Crimson on a permanent basis. -- The band had been together - in one form or another - since 1969. Only Fripp, however, remained from the original Crimson. In the intervening years, the band had been through a constant permutation of musicians and, indeed, it was only three months ago that violinist David Cross left Crimson after an American tour. The final line-up was a trio: Fripp, drummer Bill Bruford, and bass player John Wetton. -- The reasons behind Fripp's decision to split the band are complex and involved. 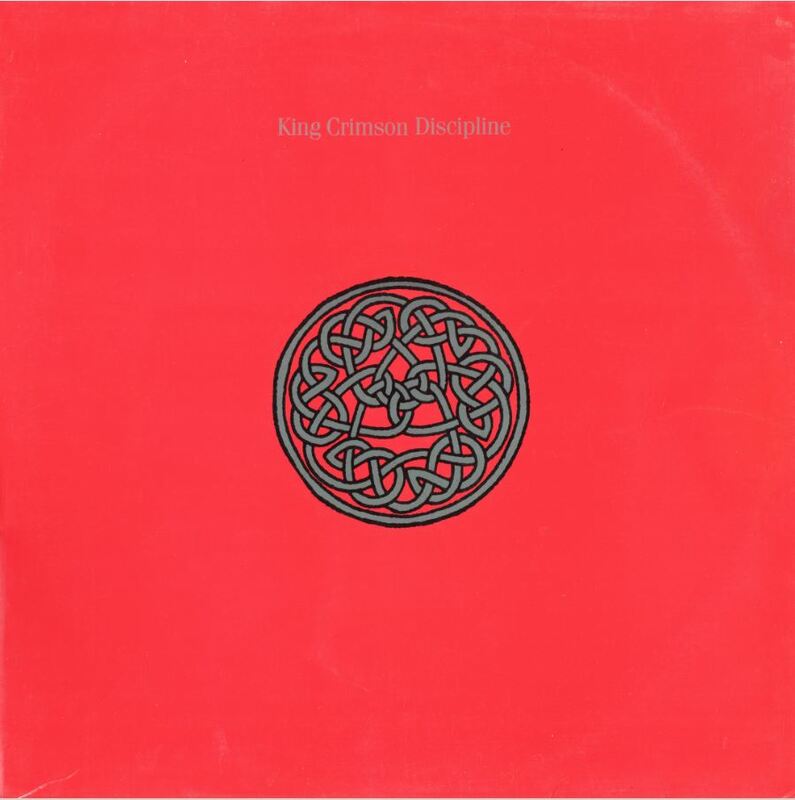 There are musical considerations, of course, but Fripp also sees underlying philosophical reasons why Crimson should come to an end. -- He discussed those reasons with the MM's ROBERT PARTRIDGE. Why have you decided to call it a day? Is the experiment over? Yes, and for three reasons. The first is that it represents a change in the world. Second, where I once considered being part of a band like Crimson to be the best liberal education a young man could receive, I now know that isn't so. And third, the energies involved in the particular lifestyle of the band and in the music are no longer of value to the way I live. But to go back to the first point, the change in the world. At the moment, we're going through a transition from the, if you like, old world to the new. The old world is characterised by what one contemporary philosopher has termed "the dinosaur civilisation,' large and unwieldy, without much intelligence - just like the dinosaur. An example of this would be, say, America or any huge, worldwide power. Another would be any large band with lots and lots of road managers... all these units originally start out to service a need but you now have a situation where, being creative, they have to create needs in order that they may continue to exist. In other words, they've become vampiric. It was becoming a dinosaur then? No, It would never have become a dinosaur. But it would have become a smaller version of a dinosaur. A mechanical situation would have developed which would have been unwieldy. And the band wouldn't have been sufficiently small, independent, and intelligent enough to exist in the new world. And those, of course, are the attributes of the new world: small, mobile, independent, and intelligent units, whether it's, ah ... instead of a city, you'll get small self-sufficient communities, modern villages. And instead of King Crimson, you're now getting me - a small, independent, mobile, and intelligent unit. That's substantially the difference between the old world and the new. But the transition between the old and the new has already begun. The old world is, in fact, dead and what we're seeing now is, if you like, the death throes. The large units have immense resources and a lot of power, albeit power of a not very nice kind or quality, which they will use to maintain their existence. They will not, I feel, be intelligent enough to realise that, in fact, they're dead and, instead of co-operating and participating in the coming of the new world, I think there will be a fight. The transition will reach its most marked point in the years 1990 to 1999. Within that period, there will be the greatest friction and, unless there are people with a certain education, we could see the complete collapse of civilisation as we know it and a period of devastation which could last, maybe, 300 years. It will be comparable, perhaps, to the collapse of the Minoan civilisation. But I hope the world will be ready for the transition, in which case there will be a period of 30 or 40 years which will make the Depression of the Thirties look like it was a Sunday outing. But you seem to be conjuring facts and figure out of thin air. How do you substantiate your claims? I base all this, firstly, on a period of living in and experiencing, first hand, the materialistic civilisation - I'm thinking of America and working in an organisation which was, although not a dinosaur, nevertheless large. I saw in America enough evidence of the breakdown of social and economic order to know that something's fundamentally wrong and it can't be reversed. You don't have to be very bright or perceptive to realise that, frankly, the system is breaking down. Life is much too complex and involved to be continued in the present way. But I've also come into contact with certain ideas... and the coincidence of ideas from different sources convince me that I'm right. Again, you don't have to be very bright to say that within ten years there's going to be considerable privation. I base my forecast on ideas from people I respect who have direct perception of these matters. I have contacts in New York who are into a very heavy economic and political situation and they put the year 1990 as the date of the crunch. Besides, it feels right to me. Yes, in order to prepare myself for this critical decade I need to acquire certain skills and abilities. The education of King Crimson has taken me to this particular point, but it can no longer educate me in the fashion I need to be educated. My education now needs to be different. Instead of King Crimson, I now need, well, that brings us to my third point, about the energies involved in working with a band. This also harks back to that first point about the change in the world. For the work I now wish to be involved in, the energies I need are not those I get from King Crimson. It was a quite superb band, but nevertheless what we were doing wasn't really for me. And I don't think for Bill or John either. King Crimson was a democratic band, we each had the power of veto, and would accommodate each other. But we'd got to the point where we discovered we were working together simply because we wouldn't be able to find musicians of that calibre outside of the band. In other words, if I wanted a rock drummer I could find a number of people to work with. But if I wanted a drummer, and not just a rock drummer, I'm stuck. There's Bill and, maybe, Mike Giles (a member of the original Crimso) and perhaps two others in England. And where would I find a better bass player than John? But whereas we'd originally come together - Bill because he wanted to work with me and John because he wanted to work with Bill - I felt that by the end we were working together because there aren't any musicians of the same quality and proficiency outside. And musically, perhaps, it was too much of a compromise. John's a rocker but Bill, on the other hand, has a very detailed and meticulous approach. When David left at the beginning of July, however, we considered working as a trio. Then Ian McDonald was joining the band for an American tour, but this would have involved three weeks rehearsals, for four weeks work - which is rather unbalanced. And then a European tour was suggested but I'd already decided the band was coming to an end. The tour would have meant that the band was on the road for another six months but I'm not prepared to keep secrets from men I'm working with and life is too valuable for me to commit six months to a situation in which I'm not whole-heartedly involved. Hence the decision to end the band rapidly. the whole thing wasn't discussed, as such, although I think both Bill and John were aware of my feelings. The energies involved weren't right. Getting on stage and having to fight the aggression of five thousand people, to beat them down to the point that they're listening... the band became very adept at going on stage and smacking straight through, but at the expense of creating something of a higher nature, if you like. To give you an idea of the work we've done this year: from January to February we made an album, then went to Europe for a tour, then immediately off to America, back to Britain for rehearsals and straight back to America for another tour. After that, I had one full day off in the country before we started recording "Red." With that kind of life there's a lot of things I'd like to do, but can't. There are my responsibilities to the land, for instance, which can only be discharged by going out there and working (Fripp owns a cottage in Dorset). Consequently you can now see me halfway up a very large tree clasping two large saws and a pair of secateurs. I am also spending more time learning, both in a very broad sense - for example, I am practically inept at anything more exciting than changing a three-pin plug - and in the field of musical electronics. I would like to become self-sufficient so that, not only am I mobile, but I'm also independent as well. In other words, I want to develop practical skills and, in addition to this, there is a mental approach involved in all these things. But what are your musical plans? They involve the creation of another small, independent, mobile and intelligent unit which is, of course, the Fripp and Eno situation. We'll be going on the road in November. Fripp and Eno is, for me, the perfect example of all the things we were talking about earlier. It won't reach the mass of people in the way King Crimson did - I hoped, you see, that Crimso would reach everyone. In terms of most bands, of course, it was remarkably successful. But in terms of the higher echelon of bands like Yes and ELP, it didn't make it. My approach, therefore, has now changed and what Eno and I will try to do is influence a small number of people who will, in turn, influence a great number. I've always known that I will not be a rock 'n' roll star, the guitar idol that millions of young guitarists learn their licks from. I'm not prepared to get involved with that star syndrome, if you like... Eno and I will be creating energies different to King Crimson. They'll be far more subtle and indirect, but they'll eventually be far more potent, they will create more. Because I know they will. What can I say? One doesn't always have the choice, but one is sometimes fortunate to have the chance to do certain things. Side one of the Fripp and Eno album is the finest thing I have ever done, it ranks with the first King Crimson album. It won't appeal to so many people but, over the years, it will come to be regarded as a classic and, in five years time, people will come to wonder how they could have missed something of that quality. Eno and I will be setting off, primarily in England and Europe... we'll be working in England at the end of November and December. It will be of a far smaller and personal nature, smaller halls and just the two of us. We'll be able to work without a great deal of organization or preparation, it will be personal, it will create the right kind of energies and it will enable our lifestyles to be civilised, it will give us a lot of time to ourselves and, of course, it will enable us to do other things. Another of my ventures is an album with Robin Trower. Robin and I got on very well in America and he's one of the very few guitarists with spirit, an unerring ability to pick what's right. His field is what many people would consider to be narrow, but that's totally irrelevant. Within that field he's immaculate, his feel and control are both superb. And in addition to this, I have been offered some production work. I'd also like to say that I'm now open to offers of production work, this is another thing about being mobile and independent. People can actually phone me up and offer me work. But I get no offers at all as a guitarist, and this is another thing I'd like to see happen. I'm looking forward to people asking me to play on records or on their gigs. Will you be playing live with Robin Trower? I'd love to do some gigs with Robin. But he has his own trio and it would be, ah, presumptuous... but if Robin asked me to do a tour I'd say 'yeah, you bet.' No way could you keep me away. But there is a fourth thing I want to see develop; I'm going to give guitar lessons. I have been pondering for some time, the creation of a new guitar technique which brings about a change in the personality of the person who's going through the discipline. I was tone deaf and had no sense of time when I became a guitarist. And, looking back over the years, I've wondered what on earth an unmusical, tone deaf, timeless dummy was doing becoming a professional musician. And I've found the answer: I needed music, and music needed me. If you accept that I needed music, then this also involves responsibilities. Because of what I received, I have responsibilities, and I can discharge these as a player. My tuition involves the creation of a technique which enables the player to have the facility to move his hands to perform an idea which has come from a feeling inside him. Isn't this the essence of most musical forms? Well, if you're talking about all harmonised and balanced music, yes. If you wish to take the rock 'n' roll musician, for example, he plays very largely from the hips. It doesn't involve any higher energies. Rock 'n' roll is not a particularly intellectual music nor is it, essentially, very spiritual. What I'm interested in doing is providing the rock 'n' roll musician with a technique which will enable him to develop a vocabulary which goes beyond all that. But in order to explain this a little more we really have to go into the elements of music. If you were to take rock, jazz and classical music: you have, I suppose, fundamental to rock 'n' roll a physical expression, this very raunchy feel, but with jazz you have a much looser approach to things, something which tends to be very emotional. And classical music demands a discipline which most rock 'n' roll musicians would find frightening. Each of these kinds of music exist on different levels. There's the particular kind of feeling associated with each of them, and there's the separate vocabularies needed to express those feelings. What my guitar technique will do is enable is enable musicians to move more freely from one form of music to another since, in learning the technique, his personality will be put under sufficient stress that he will not only develop emotionally and mentally, but the feelings involved will change his personality. In other words, it's not so much a guitar technique as a way of life. 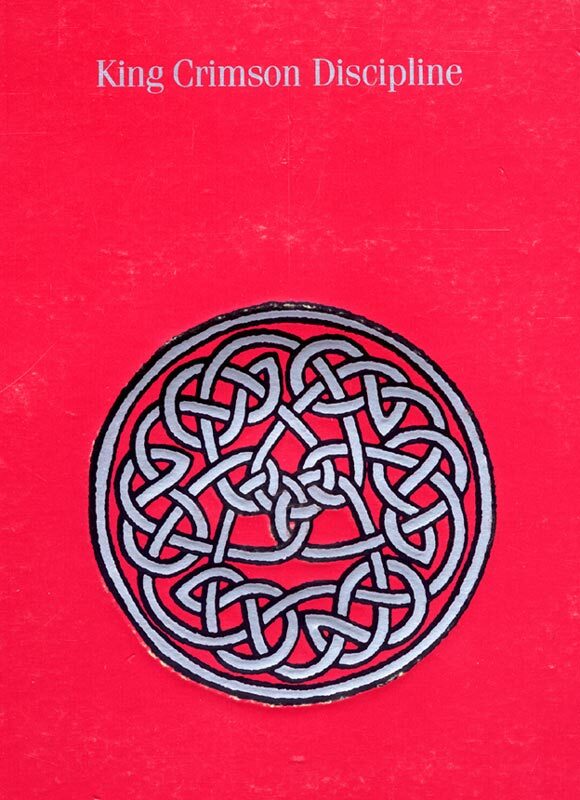 This symbol shown above is the Possible Productions knotwork, designed by SB in 1992 on commission from Robert Fripp. This symbol has been used as a logo by both Possible Productions (Robert's music company) and Discipline Records (Robert's label) extensively and exclusively from 1992 to the present. 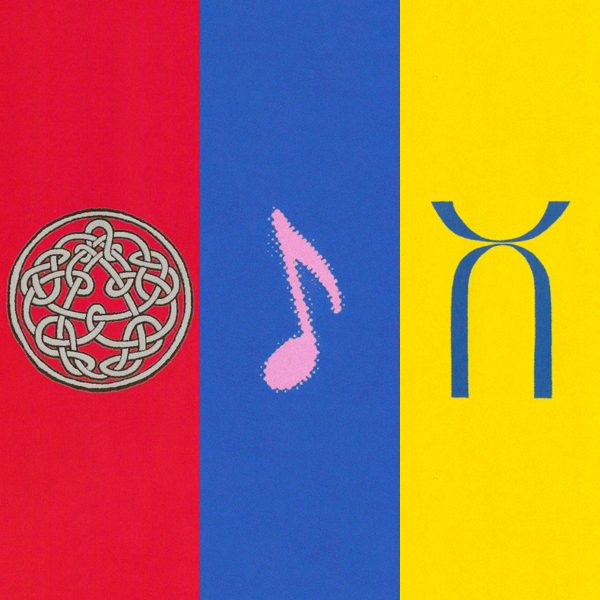 This symbol was also most recently used on the new rermastered re-release of Discipline by King Crimson. The symbol that was on the 1981 EG Records release of Discipline is Fig. #1 shown below. This symbol has a somewhat longer history. 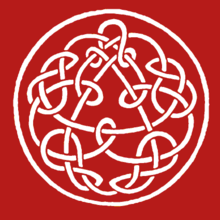 1 - knotwork from the original 1981 King Crimson Discipline album cover, "designed" by a character (intentionally unnamed) who participated in some residential seminars at Claymont Court in the late seventies. 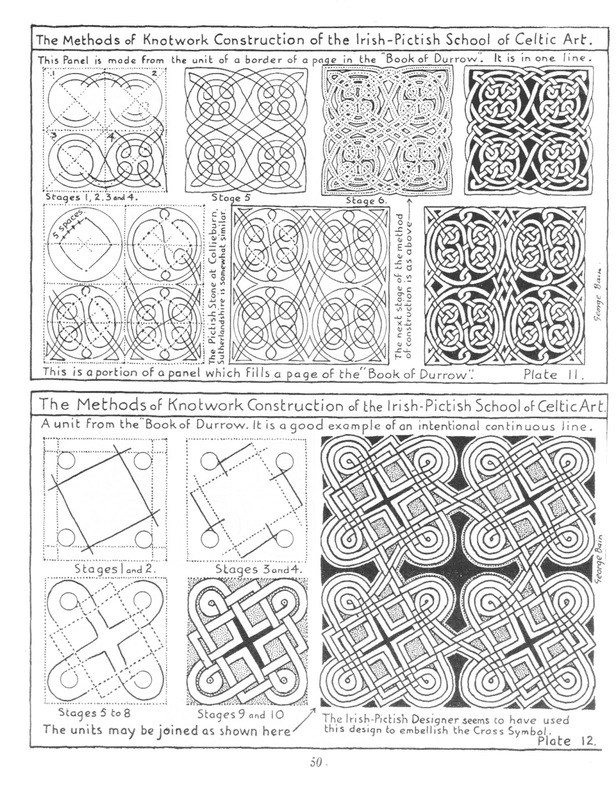 2 - the source and 'inspiration' of this design, from page 40 of "Celtic Art - the Methods of Construction" by George Bain. Here is some background about the origin of the "original" symbol which the designer claims to have "designed." 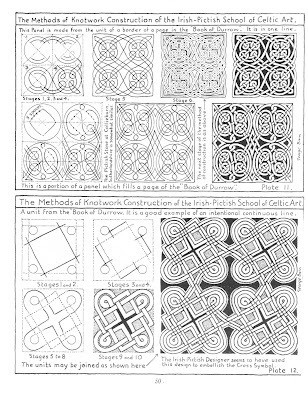 The 1981 "design" is actually a derivative work (with one minor change) of a copyrighted design by the celebrated Celtic art historian, George Bain. 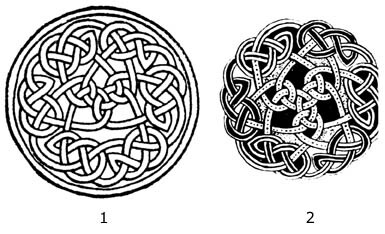 Mr. Bain's original design first appeared in public in a well known book entitled "Celtic Art, the Methods of Construction" published in 1951 by Constable Press in London. 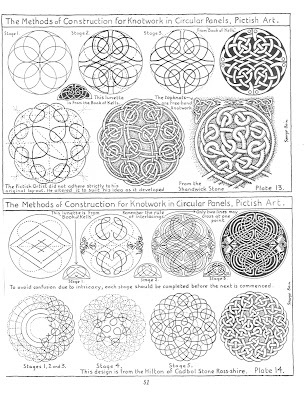 George Bain's design is an illustration demonstrating a method for constructing a circular knotwork design. In short, the original design was not strictly 'original' in that that 95% of the actual design rightfully belongs to George Bain. There is one minor (arguably, significant) modification in the 1981 design: there is one cord which does not wrap around the center triangle, which is clear if you compare the diagrams shown above. My (granted) biased view is that this character was looking for some publicity and/or some attention. Given the obvious nature of this derivative work, it is clear that the designer has very little ground on which to stand in defending an intellectual-property-oriented copyright in his "original" work. True, the character's specific rendering of George Bain's intellectual property is certainly copyrightable, however, in my view, this designer owes George Bain a substantial debt for the overall concept and design of this symbol. 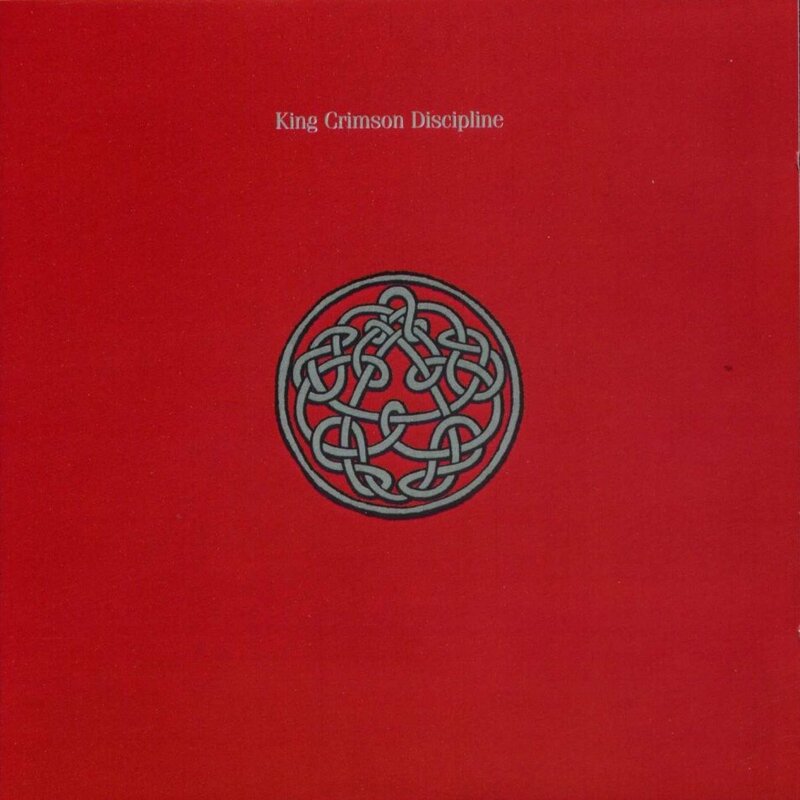 The 2001 re-mastered Discipline cover uses the Possible Productions knotwork rather than the original 1981 design because DGM chose to abandon the original design rather than enter into a legal battle with the original designer and "his" alleged symbol. That really is the short version. Trust me - you really don't want to hear the long version.